A six-year-old piece of news surfaced over the course of the past week, and while there's little actual "news" involved, it's somewhat amazing to observe how much has changed in the world around us in this short period of time. The news, focusing on Brad Pitt and Angelina Jolie's eight-year-old child, serves as a wonderful case study on the evolution of the media. In 2008, while promoting the The Curious Case of Benjamin Button, Brad Pitt went on the Oprah Winfrey Show to discuss acting, his relationship with Angelina Jolie, and what it's like to be the parents of six children. Buried late in the interview is a quick anecdote about the couple's oldest two-and-a-half-year-old child, Shiloh. "She only wants to be called John," Pitt told Winfrey. "John or Peter. So it's a Peter Pan thing. So, we've got to call her John. 'Shi, do you want —' 'John. I'm John.' And then I'll say, 'John, would you like some orange juice?' And she goes, 'No!' So, you know, it's just kind of stuff that's cute to parents, and it's probably really obnoxious to other people. Two years later, Life & Style magazine ran a cover story asking, "Why is Angelina Turning Shiloh into a Boy?" The magazine trotted out a number of celebrity stylists to critique the then-4-year-old Brangelina progeny. "Shiloh is pushing the boundaries of a tomboy look and crossing over to cross-dresser territory," then-VH1 senior fashion stylist Alana Kelen told Life & Style. "I get that times are tough but does Angie really need to have Shiloh sharing clothes with her brothers? Hopefully we won't be seeing Maddox in one of Shiloh's dresses any time soon," adds stylist Gili Rashal-Niv. These jabs, along with the magazine's wider coverage, earned Life & Style a rebuke from LGBT watchdog organization GLAAD, who categorized the coverage as "sensationalism." As Life & Style demonstrated, media coverage of John circa 2010 was harsh, and often attempted to portray Pitt and Jolie as bad parents for not restricting their child to feminine gender norms. "A boy's haircut and clothes," "calls her 'John,'" and "no girlie things" were laid out on the magazine cover as an indictment of the power-couple's parenting skills. "Is it harming the 3-year-old?" In the years since, focus on the Jolie-Pitt household's family life faded. But this week, the Internet became abuzz with seemingly new information about now-eight-year-old John Jolie-Pitt. 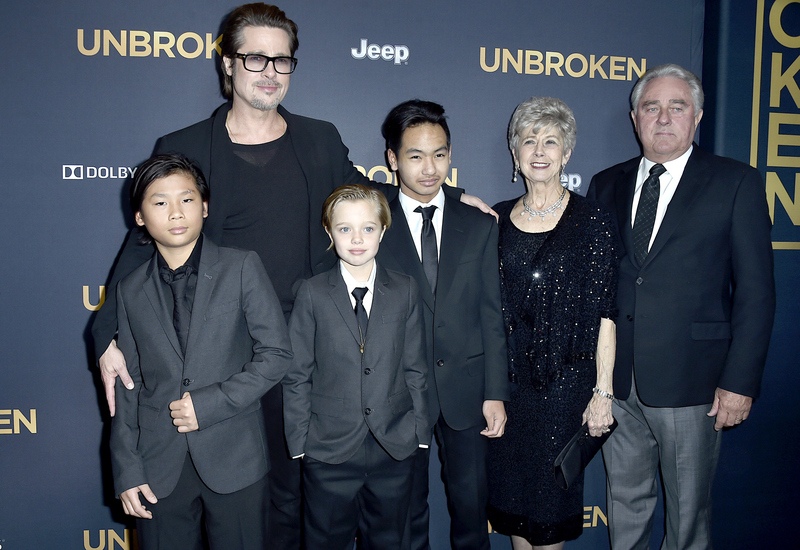 At the Los Angeles premiere of Jolie's latest film Unbroken, John joined brothers Pax and Maddox, along with father Brad, and grandparents Jane and William, on the red carpet. The seemingly newsworthy element of the story was that John, like Pax and Maddox, was dressed in a suit. A number of outlets — including Bustle — initially treated this as a fashion story. Britain's The Daily Mail wrote on December 16th, "Shiloh Jolie-Pitt looked the perfect picture of her mother and father on Monday night," adding, "Wearing a sharp suit and a hairstyle reminiscent of her dad's from the nineties, Shiloh certainly stole focus as she lined up with her brothers on the red carpet in Los Angeles." Given that the request to be referred to as "John" hadn't been brought up much since Pitt's 2008 interview, the media had continued referring to John as "Shiloh." The Daily Mail referenced a 2010 interview — by which they meant Pitt's 2008 interview — where Pitt shared the child's preferred name. Two days later, on December 18th, The Telegraph ran a feature asking, "How should parents react to children questioning gender roles?" Within, journalist Radhika Sanghani speaks with psychologist and author Linda Blair (no, not that Linda Blair) about John's early insistence on being called "John" and proclivity towards more stereotypically masculine toys and styles. She adds that it's possible that this is merely part of a harmless, healthy exploration of gender that a lot of children experience. On December 20th, The Advocate's Sunnivie Brydum wrote a piece titled, "Brad Pitt and Angelina Jolie Support Their Kid Wearing Suits." This well-written piece takes care to not impose pronouns on young John, and avoids making assumptions about what the child's gender identity may or may not be. "Whether the young Jolie-Pitt will grow up to identify anywhere along a gender-nonconforming or LGBT spectrum is impossible to tell, but one thing is certain — having parents that embrace a child's curiosity, independence, and self-direction is sure to make that young person's life easier as they go through the fundamentally human process of discovering who they truly are," Brydum concludes. Having parents that embrace a child's curiosity, independence, and self-direction is sure to make that young person's life easier as they go through the fundamentally human process of discovering who they truly are. Last week also saw a slew of articles deconstructing the media's fascination with John, including pieces by Marcie Bianco at Mic , Heyden Manders at Refinery29 , and a wonderful breakdown by Gabrielle Korn at Nylon . While none of these articles are perfect — Bianco uses a mix of pronouns, and refers to John using terms like "gender nonconforming" (you can't possibly know whether or not someone is "gender nonconforming" without first knowing what their gender is. In this case, we simply don't know John's gender) — they all highlight an evolving attitude towards children who don't align with culturally-constructed norms typically associated with the gender they were assigned at birth. In effect, we've moved on from, "Is Angelina Jolie a bad mother?" (Singling out Jolie without mentioning Pitt as possible "cause" for John's association with gender taps into deeper forms of sexism, but that's a different story for a different day), to now simply saying, "Kids like John exist. Now what?" Is John transgender? Maybe. Does John use masculine pronouns? Feminine pronouns? Gender-neutral pronouns? I don't know. Should it matter to the general public? Absolutely not. What matters is that John appears to be in a family that accepts who they are, allows them the space to explore gender and societal norms, and become their own person. The world could benefit from more parents taking cues from Jolie and Pitt, and help put a stop to the rampant mistreatment and homelessness of children who fail to meet parental and societal expectations of their perceived gender. While this is a step forward, it's just that: a step. Yes, the media's sensitivity appears to have improved as time has gone on, but as we see in the confusion over what names and pronouns to use, there's still work to do. In a perfect world, we wouldn't simply assume that someone assigned female at birth uses feminine pronouns, or that someone assigned male at birth uses masculine pronouns; we would let them tell us. By setting a default, children who identify or express themselves outside the gender and gender norms to which they're expected to conform are already facing an uphill struggle. We should hope that as time goes on, these barriers to self-expression and identification are slowly eroded. Until then, here's John.